The average consumer may not be aware of the suffering of billions of birds raised for meat and egg production in the United States each year. Billions of "broiler" chickens and "egg" chickens, and millions turkeys, are killed for food each year. In addition, millions of birds die as a result of disease, injury and during transportation. Egg-laying hens in the United States number more than 459 million. Of these millions of birds, 97% are confined to "battery" cages, tiny cages roughly 16 by 18 inches wide. Five or 6 birds are crammed into each cage, and the cages are stacked in tall tiers. As many as 50,000 to 125,000 battery hens, in sheds with minimal light, strain to produce 250 eggs per year, ten times the number of eggs they would produce in the wild. Battery cage confinement does not allow birds to turn around or take part in any other natural behavior, such as preening, dust bathing, and foraging for food. Prolonged forced confinement causes unnatural behaviors such as cannibalism and increases the incidence of disease and injury. Laying hens are also forced to live in a polluted environment due to toxic feed ingredients, accumulated feces, and excretory ammonia fumes. 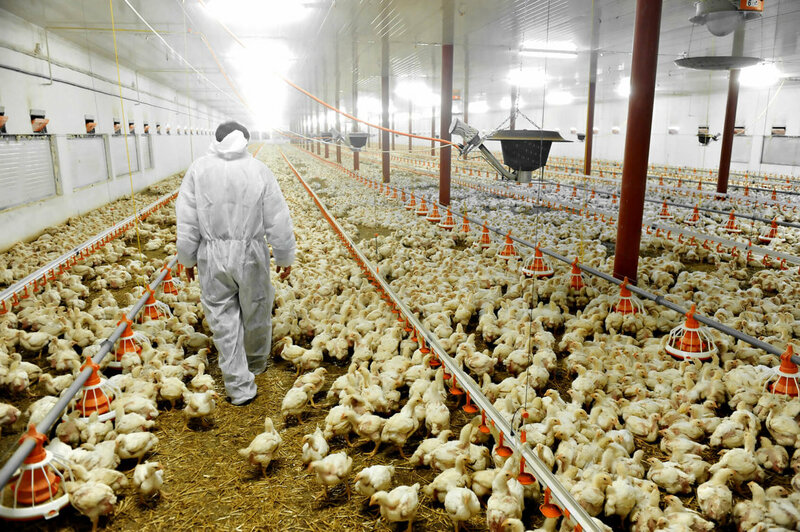 A successful battery system relies heavily on antibiotics that are routinely administered to laying hens to decrease the incidence of disease among these immune-repressed birds. Battery hens often die in their cages as the result of disease or injury. Those who survive but stop producing adequately are considered "spent" hens and are sent to slaughter to be used for human and animal food. Male chicks are of no value to egg producers. Each year more than 200 million male chicks are killed or left to die after hatching. Egg-producing birds that are not confined to battery cages seldom fare much better. Eggs labeled "Cage Free" or "Free Range" simply mean that the birds are not confined to battery cages, not necessarily that the hens are allowed a more natural existence. Neither guarantees that they have adequate space to move around, or that they are allowed outdoors to roam about and forage or dust bathe. Molting is the natural process of shedding old feathers and the growth of new feathers. Molting initiates a new egg-laying cycle. The natural molting process takes about four months to complete. However, on factory farms, poultry producers induce starvation to control egg production in laying hens (eggs for human consumption) and breeding hens (eggs that hatch into birds used for meat or egg production) to reduce the molting period to one to two months. Performed to increase farm profits, this "forced molting" is extremely stressful to hens. Forced molting methods include food and water deprivation, medications and simulated light and dark cycles. A Poultry Science report found that forced molting in combination with a Salmonella infection created an actual disease state in tested hens. Salmonella infection can be passed on to consumers through egg consumption. Debeaking is a painful procedure whereby the bird's sensitive beak is sliced off with a hot blade. Poultry meat and egg producers that use battery cages and crowded floor systems remove one-half to two-thirds of the birds' beaks to discourage cannibalistic pecking, a behavior that occurs when birds are kept in close confinement with no regard for their natural behaviors. Behavioral studies indicate that debeaked birds are often unable to eat, drink, and preen properly. They also exhibit behaviors associated with chronic pain and depression. Toe-clipping is the amputation of a bird's toes just behind the claw. This painful procedure is performed to reduce claw-related injuries on factory farms. Genetic engineering of broiler chickens and turkeys often results in a bird too heavy to stand or walk. They suffer from pain in their legs and sores on their feet that are induced by their extreme, unnatural size. Kept in polluted dark sheds with as many as 25,000 birds per shed, these birds suffer many of the same ailments as battery hens, such as being debeaked and being forced to live in a toxic environment. Thousands of these birds never make it to slaughter -- they will die while still on the farm from injuries, disease or their inability to reach food and water. Millions of birds die during the loading of trucks and while en route to slaughter. These sensitive birds, often in very poor physical condition, are grabbed by their legs and thrown into densely packed cages to be transported by truck to slaughterhouses that are sometimes hundreds of miles away. Many die from shock, injury, and suffocation in the process. The U.S. Federal Humane Slaughter Act does not apply to poultry, meaning that there is no federal law that requires birds to be stunned prior to slaughter. This allows for diversity in commercial poultry slaughter approaches and stunning equipment. When slaughterhouses do use stunning equipment, lack of regulation often results in birds allowed to raise their heads prior to reaching the water bath stunner and therefore not adequately stunned. Problems also exist in neck-cutting equipment, which may result in prolonged and extreme pain caused by necks improperly cut during the killing process. Decrease or eliminate foods containing poultry products from your diet. The Dietary Guidelines for Americans published by the USDA and the U.S. Department of Health and Human Services endorses a vegetarian diet.